Ripple Effects for Staff provides “just in time” professional development for teachers, counselors and other school personnel. More than 1600 multi-media screens comprise 136 multi-media tutorials, which include Video True stories from dozens of teachers. The lessons can be accessed on a “need to know,” time critical basis, or can be completed in sequence. Certification is available from Ripple Effects for completion. The program has also been accredited by Long Island University, and is currently being reviewed by Teacher’s College, as the core of Dr. Robin Stern’s on-line course on Educational Leadership through Social-Emotional Competence. It can be completed for graduate credit, upon payment of additional fees. Resources offered include disk-based, rich media content, plus web-based access to additional resources, from class room posters to individual treatment plans. How it works: The program is comprised of 136 multi-media tutorials (with video true stories from teachers) organized into three modules. The lessons can be accessed on a “need to know,” time critical basis, or can be completed in sequence. Certification is available from Ripple Effects for completion. Resources offered include disk-based, rich media content, plus web-based access to additional resources, from classroom posters to individual treatment plans. Using any of the three modules, trainers can lead implementers through a pre-determined scope and sequence; individual professional staff can use it on their own to get up and get going fast, or to find quick solutions to immediate concerns. Module I: Strengthening Your Leadership: 48 tutorials/12 contact hours. Personal transformation through mastery of key social-emotional abilities. See the Scope and Sequence. Module II: Managing Diverse Learners: 29 tutorials/7 contact hours. Addressing learning, behavioral, social, cultural issues that challenge students and teacher alike. See the Scope and Sequence. Module III: Making Programs Work:The nuts and bolts of successful implementation with 57 interactive tutorials/14 contact hours. See the Scope and Sequence. Ripple Effects for Staff Teaching Coach offers over 50 tutorials. 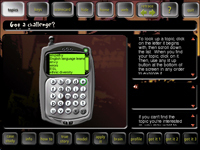 They are accessed in two ways: though pre-programmed units; or via an A to Z index, displayed in a mock cell phone pictured at right. Below is a list of the topics by unit. You can download the topic list. "We used Ripple Effects for Staff in the trainer training. It’s as intuitive as any software I've ever seen."